Update 8/23/12: $310,000 hammer has members of the exclusive club known as ‘early lightweight Sprint Veloce owners’ all calling their insurance agent to up the agreed value, and then thinking about whether or not they really need that jewel in their jewelry box at that price. 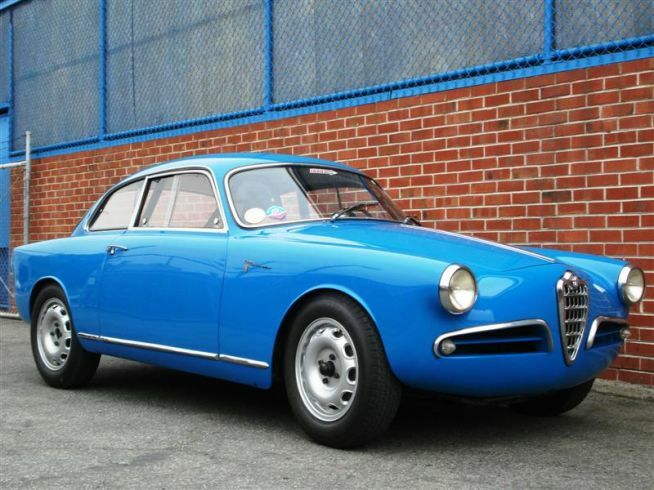 8/11/12: Giulietta Sprint 750 E 1493*02239, 1315*30135, Bertone body number 77117. This car will be auctioned by Russo and Steele next weekend with an expected hammer around $200,000. With a high expected price comes high praise and/or high scrutiny. d’Amico and Tabucchi list this chassis number as a 1956 Sprint Veloce 750E, good enough for me! It has been magnificently restored to a semblance of ‘last raced’ specification, with lightweight seats, a lack of bumpers and other details deviating from stock. 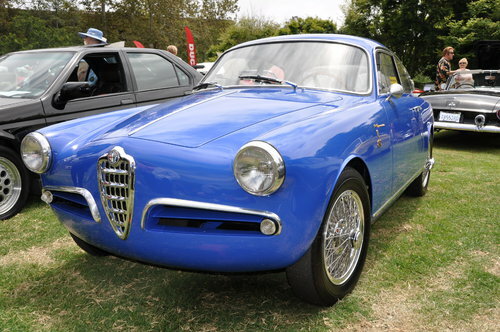 It is doubtful it wore the Borrani wire wheels shown since -not only have I never seen a period picture of a Giulietta racer with wire wheels, they were very likely heavier than the usual Fergat or Borrani wheels due to the required extra splined hub adapter. A lot of the ‘lightweight’ treatment was replacement of chrome-over brass parts with aluminum. Body fits together with the typical Bertone precision. Would be nice to see it wear it’s original, most likely lost 50 years ago aluminum bumpers. I have read they are available -I know ClassicAlfa and Alfastop list a few of the aluminum parts, not sure if they have bumpers. Giulietta Sprint Veloce ‘Alleggerita’ 750 E 1493*03819, 1315*30348. 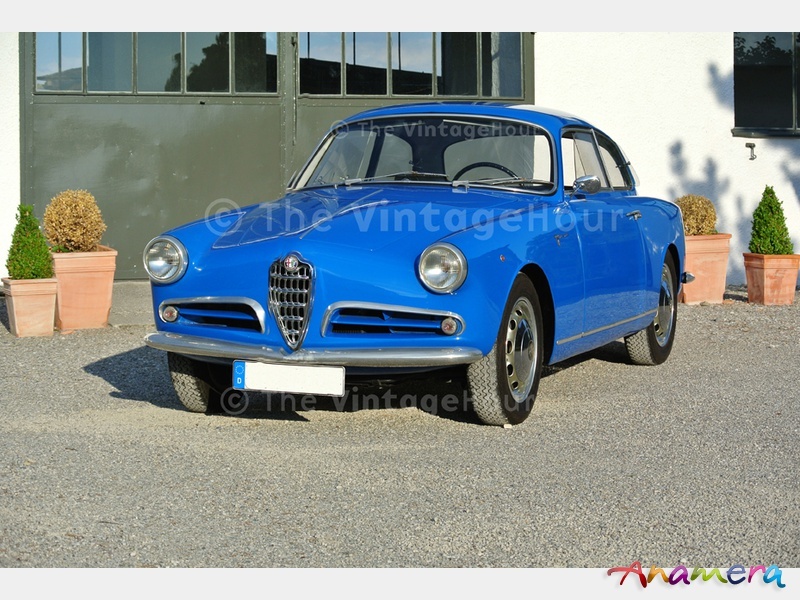 This 1957 Sprint Veloce is available now out of Italy. It is a good comparison with yesterdays lightweight Veloce, especially in the interior -would be a great comparison if I knew how much they were asking. They made about 600 lightweights if my vin/body number math is sound. Not horrifically rare as far as rare Italian cars goes, but these being very potent machines in their hey-day, frequently vanquishing their own class and placing very high outright in races against competitors with 2 or 3 times the displacement, and being constructed from lots of impossible to find special parts, they have all the cache one could want in a 50 year old Italian car. Oh -and they are beautiful and easy to drive -even among modern traffic. Hood fits very well. I like the extra lights -looks like 1 fog and 1 spot. Marchal’s? Bumper, eyebrow trims and headlights all look like aluminum to me. Nice car. 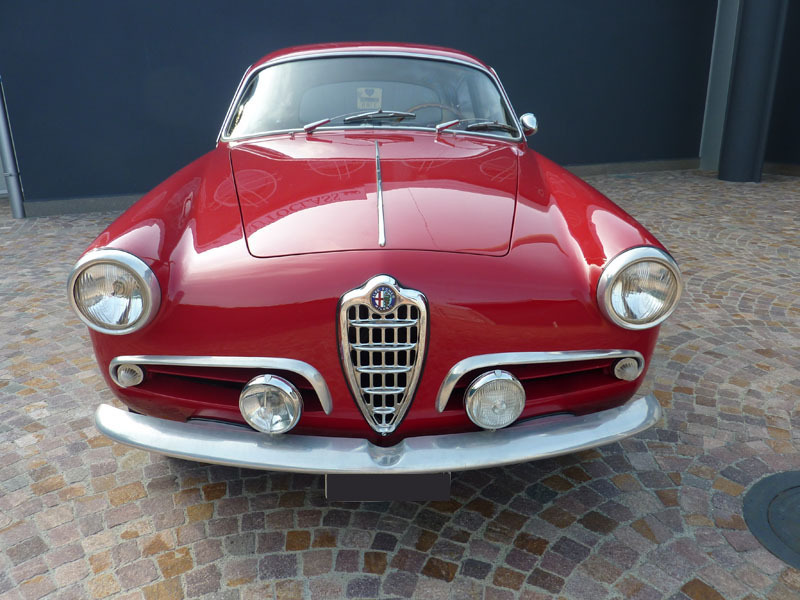 Giulietta Sprint 750E 1493*04239, 1315*30449. This car is listed on Antea Cars out of Japan. I haven’t had the opportunity to write about very many lightweights, but they all seem to be this color so far. Car is in great shape -only really lacking in the originality dept, and only minorly, but nothing a few bucks wouldn’t cure. It is described as having been restored in Japan, which is probably a good thing. Enthusiastic, detail oriented folks if the few genuine articles I’ve met were a representative sample. I wonder if this car did anything race-wise back in the day… Did these have little market lights? I like this color, but is it lighter in pictures than in person? In the Coup Des Alps footage it’s a little darker looking Body is in very nice shape. Update 5/7/10: 24 bidders resulted in $70,100. This is pretty low, but probably not a huge reflection on the value of this car. I think it’s more like $100K. Chances are it’s not goingf to be let go for that though. Update 4/29/10: This car has been listed on eBay after hanging out in their showroom for most of a year. Still fabulous, still too much money for me. Sigh. Seller claims this is one of only 100 Sprint Veloce lightweights made but there is an often published list of the first 100 Sprint Veloce Lightweights, the date they were produced (July of 1956 is the last car on that list), who bought them, where they were shipped, and this car is not on that list, in fact, if you add that list of 100 to the other known lightweights you get close to 130. This car is body number 77498, so I would deduce it’s the 498th Sprint Veloce lightweight made, though they were not necessarily made in numerical order. Some argue that not all of those Sprint Veloce’s were lightweights, but I would rebut: “Why make special lightweight bodies then dress them in non-lightweight clothes?” Greig Smith writes very convincingly and with sound logic on this topic and deduces that there were “about 600 lightweights made“. See his comments and reasoning at the link. Am I blue? 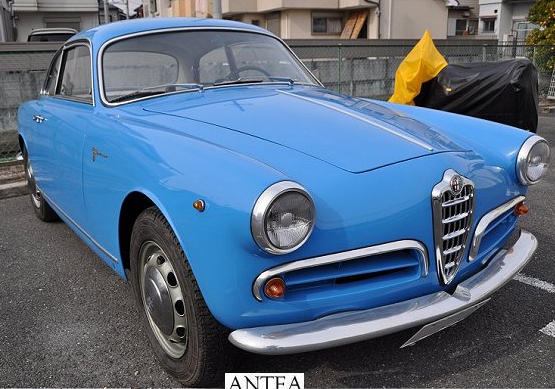 I keep thinking that if I work hard making my Alfa fleet the best it can be, one day I will be able to have a blow out sale and buy 1 spectacular Alfa. 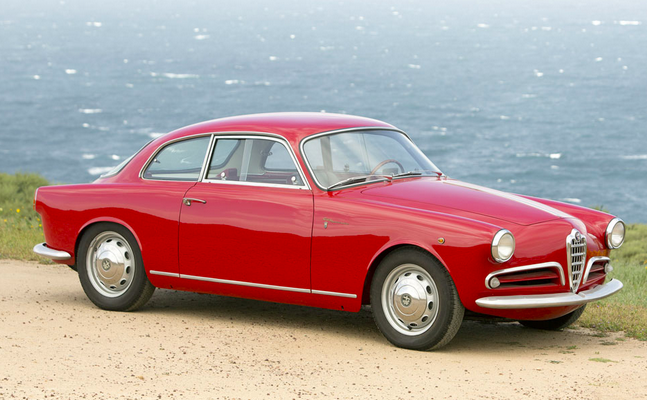 It would be either a Giulietta Sprint Veloce Lightweight or a Giulietta Sprint Veloce Zagato Coda Tronca. It will be expensive and I will miss driving with reckless abandon in my scruffy Sprint.